Monday 8th September 1856 - Fine of 5s 6d and 14s 6d costs for keeping house open after 10 pm for the sale of beer. 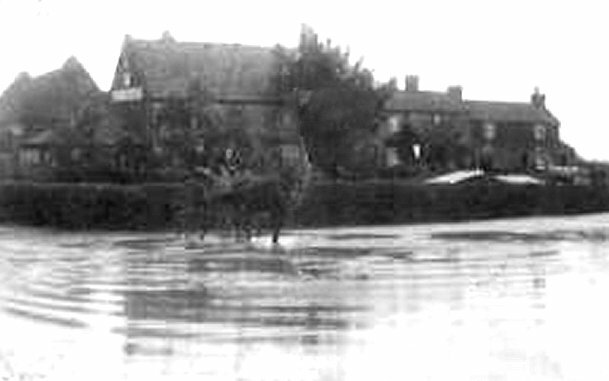 A glimpse of the Victoria during the floods of 1912. 2002 - Image provided by Jayne Young. 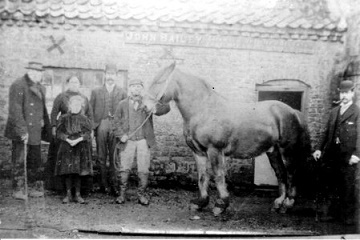 c1881 - Landlord John Bailey jnr. with wife Sarah to his side. Daughter Sarah stands in front of her mother. Son William John stands behind the groom holding the horse. Son John stands at the extreme right. Offered for sale by auction by Mr Stephen Gregory as sale report in the Lynn Advertiser 2nd June 1899. 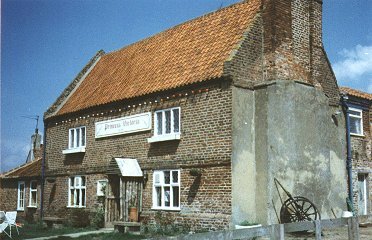 The beerhouse being in the occupation of Mr J Bailey and including barn, stables and outbuildings. 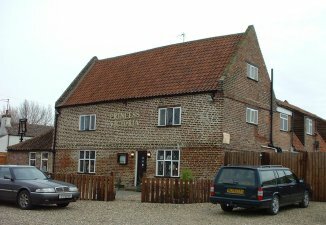 Full licence granted 13th March 1939 by removal from the SHIP INN, Tilney. Penny In The Hole played here to at least the1950's. 6 `coins' used, one being a 1797 Heavy Penny the remainder being lighter brass discs. Advertised to be auctioned 11th May 1990. Described as offering extensive accommodation including a sizeable public bar, snug, large Cromwellian bar, restaurant area, kitchen, upstairs living accommodation and two 18ft attic rooms. Large car park. Planning `change of use' granted by November 2002.